April Showers Bring May Lettuce, What? As the weather improves so does the number of sampling projects, and thanks to clients like yourselves, CARO coolers have been flying off the shelves! Given the volume of bottle orders that have been coming through, we figured this would be an opportune time to highlight our next instalment of cooler surprises! For those of you who are new to our blog, our ‘Cooler Surprise’ Program is CARO’s way of breathing a bit of humour and excitement into our industry. Included with bottle orders is a small token of our appreciation, that is chosen to be both practical and fun, and intended to brighten your day in the field. 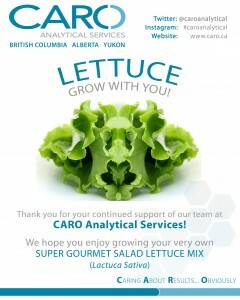 This season we have chosen to combine our appreciation for science with our love for food, and bring you “Growing with CARO!” It is an also opportune time considering our exciting expansion into the food analysis sector (read more here). Contained in each cooler will be a customized Lettuce Seed packet, with the seeds necessary to grow your own salad mix. Lettuce (Lactuca Sativa) is a robust plant that can be grown almost anywhere, so whether you are growing in a planter box on the balcony of your condo or in your backyard garden, everyone has the opportunity to exercise their green thumb! Thank you for joining CARO in our endeavours to change the industry – we hope you enjoy growing with us!